Here is part of the referencing for Galatians 1:1. The TSK from SwordSearcher on Galatians 1:1. The first thing we see is A.M. 4062, which indicates that this was written 4062 years after Adam was created. The second is A.D. 58, an approximation of the time it was written according to our modern calendar. Now to the good stuff. The next we see is “an” followed by three references. These cross-references are not really about the word an, rather, they are for the phrase an apostle from our verse. Likewise, the next section, “not”, are references for the phrase not of men, and “neither” is for “neither by man,” and so on. These three verses immediately expand our knowledge about what it meant that Paul was “an apostle.” If we are studying Galatians 1, what have we learned from this one, tiny spot so far? An apostle was called and separated. An apostle was such through the will of God. Paul was an apostle of Jesus Christ. Again, by the will of God. This is, admittedly, a simple example, but that simplicity affords us the ability to see how the TSK is meant to be used. And so here we learn the very mode of apostleship (an in-person calling of Christ himself) and the beginning of Paul’s calling in particular. I could go on, but hopefully this has sufficed to demonstrate how the cross-references in the Treasury of Scripture Knowledge are designed to be studied. In addition to these “intra-verse” references, the TSK also provides numerous “general references” on thousands of verses that are more broad in how they are to be applied in study. 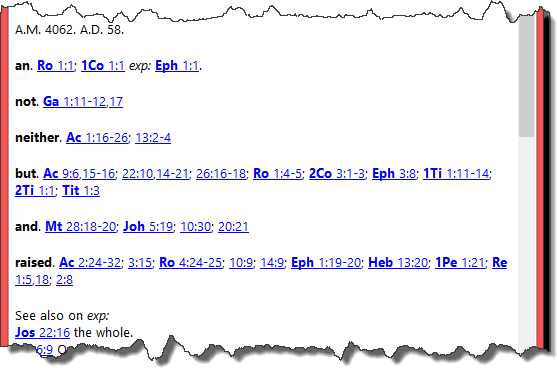 These are no different from the verse references provided in many study Bible margins and other commentaries. I hope this tutorial has been helpful. More information on the Treasury of Scripture Knowledge, and the SwordSearcher TSK module in particular can be found here.